I have officially taken on too much again! I have found myself in a situation of apple overload this week. 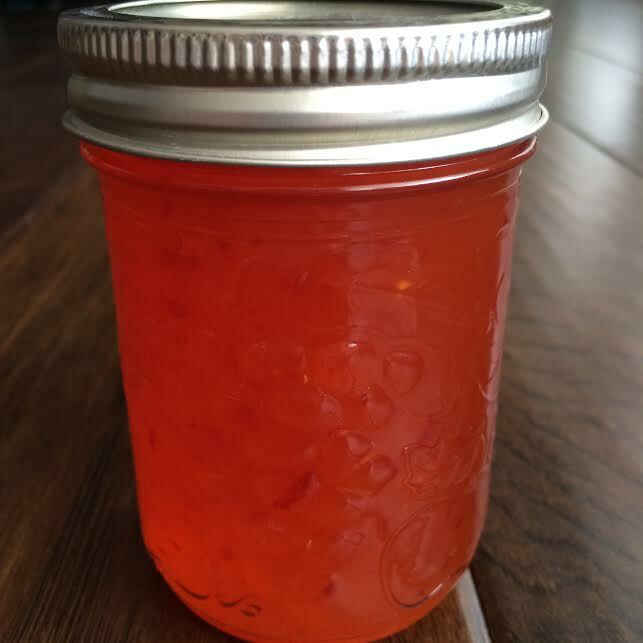 After tackling making two batches of plain apple jelly, 6 apple pies, and 3 batches of this apple pepper jelly, I STILL have plenty more apples available for additional pies, crisps and sauces. This was BY FAR my favorite recipe I came up with for this year's apple bounty. I've never made hot apple jelly before, but I combined a few recipes for other fruits and have decided this is a winner! Be sure to finely chop the peppers in the blender, first. Properly skim the jelly so you don't end up with the dreaded floating peppers! -*Prepare apple juice ((*Cook down 3 quarts of cooking apples + 3 cups water, mash, and then strain the juice for fresh apple juice), OR measure 2.5 cups of store-bought apple juice (any variety will do). -Combine peppers and water in a blender and whiz until finely chopped. 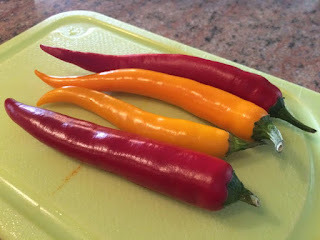 I do not seed any of the peppers, but you can remove them if desired to control the heat level. -Stir together prepared juice, vinegar, hot pepper mixture, and pectin powder in a large stock pot or sauce pan. Bring to a boil, stirring constantly. 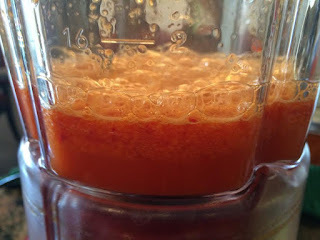 -Ladle mixture into 4 or 5 prepared (sterilized, warm) 1/2 pint jars, leaving 1/4 inch headspace. Process in a boiling water bath for 10 minutes. Cool and allow to rest for 24 hours prior to opening. I love pepper jellies and make them often but never with apple. Yours looks great! Ha! I appreciate the comments. I must say that I think it's my new favorite, and I really only made it out of pure necessity because I was out of ideas. Funny you should comment on this now because just a couple days ago I came across a Strawberry Chipotle recipe of yours in an old magazine that is definitely on my must try list now!